We are now primarily suppliers of Read-Mix concrete and we work with some of the countries leading contractors and local authorities. We have gained the reputation for being efficient and reliable. Bristol based company Cementation Piling commented "Gilbert Birdsall's supply and service were excellent, there was never any hesitation". If you intend to work with Ready-Mix yourself, please note that there are health and safety issues which you should observe. We supply Ready-Mix for all applications.See below to see how to give us the details we require for your order. There are many different mixes for different applications. We will supply the appropriate mix for your job. We also do coloured concrete for driveways etc. 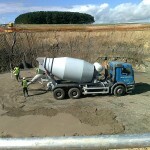 Concrete is supplied by the cubic metre. 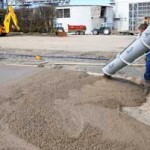 So that we can determine how much is required, it will be necessary for you to measure the shape to be concreted. All dimensions must be in the same units - metres, feet, yards. The depth of the example above is obtained by placing a straightedge or tight string-line across the top of the formwork and measuring the depth in several places. 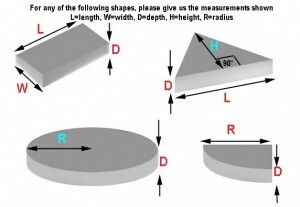 We use the average of these measurements to calculate the volume of concrete you require. Our minimum delivery is ½ cubic metre.